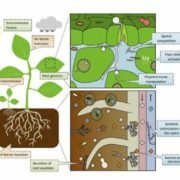 The plant immune system is effective in conferring resistance to various invading pathogens and pests. 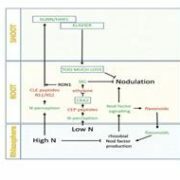 Membrane-localized pattern recognition receptors (PRRs) and intracellular nucleotide-binding domain, leucine-rich repeat proteins (NLRs) recognize pathogen-associated molecular patterns and pathogen virulence effectors, respectively, to initiate robust downstream responses that effectively contain or eliminate the invader. Infection at a local site with either virulent or avirulent pathogens can then activate a primed state in the whole plant termed systemic acquired resistance or SAR (Fu and Dong, 2013). The pathogen-inducible, AGD2-LIKE DEFENSE RESPONSE PROTEIN 1 (ALD1)-mediated biosynthesis of the L-lysine-derived amino acid pipecolic acid (Pip) and a subsequent, FLAVIN-DEPENDENT MONOOXYGENASE 1 (FMO1)-catalyzed hydroxylation leading to N-hydroxypipecolic acid (NHP) are integral metabolic events for SAR establishment (Hartmann and Zeier, 2018). Although it is well-established that the signaling cascade downstream of PRRs and NLRs leads to MAP kinase (MPK) transphosphorylation, it is unknown how MPK signaling relates to systemic plant immunity. In their latest paper, Wang et al. (2018) provide convincing evidence for the SAR-MPK connection through a combination of genetic, biochemical and physiological approaches. The first line of evidence came from characterizing the MKK4DD mutant, which leads to constitutive activation of MPK3 and 6 (Ren et al., 2002). 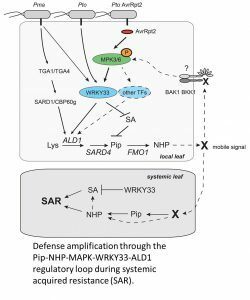 Localized MPK activation led to induced expression of the SAR-associated gene ALD1 and accumulation of the SAR metabolites Pip and NHP. 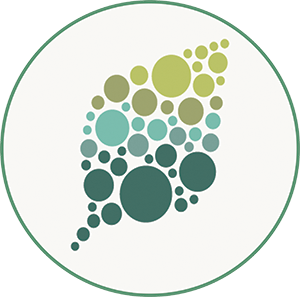 These physiological changes consequently enhanced bacterial resistance in systemic leaves. Significantly, this enhanced systemic resistance persisted in the salicylic acid- (SA-) deficient sid2 background, suggesting that sustained MPK activation acts redundantly with SA during SAR by increasing levels of NHP. Consistent with this, mutations in ALD1 and FMO1 abolished the MPK-induced SAR phenotype. 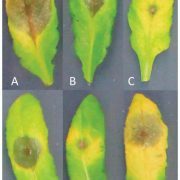 One of the target proteins of activated MPK3/6 is the WRKY33 transcription factor, which is a central regulator of plant immune responses (Mao et al., 2011). Mutation of WRKY33 compromised MKK4DD induction of SAR, concomitant with reduced SAR gene expression and Pip levels. Because these observations were shown not just for Pto but for another pathogen as well (P. syringae pv. maculicola), this suggested that MPK-activated SAR converges at WRKY33. Consistent with this hypothesis, this study and a previous study (Birkenbihl et al., 2017) demonstrated that the WRKY33 transcription factor binds to the promoter of the ALD1. To come full circle, Wang et al. (2018) showed that Pip could induce MPK3/6 phosphorylation. They first noticed that the retarded growth phenotype after Pip treatment is dependent on BRI1-ASSOCIATED RECEPTOR KINASE 1 (BAK1) and BAK1-LIKE 1 (BKK1), which are co-receptors during PRR signaling. This observation suggested that Pip might be perceived by a PRR, which would be expected to activate MAP kinase signaling. The authors confirmed this prediction, demonstrating a positive feedback loop consisting of Pip/NHP activating MPK3/6, which activates WRKY33, which induces ALD1, thus leading to elevated levels of Pip and NHP. This comprehensive mechanistic investigation of SAR answers longstanding mysteries in plant immunity. However, several interesting observations in this study raise important questions. Why is SA necessary for Pto-mediated SAR but not for Pto AvrRpt2-mediated SAR? What is the receptor for Pip and its derivatives that is dependent on BAK1/BKK1? Is Pip behaving like a host-derived damage-associated molecular pattern? Is SAR a manifestation of long-distance pattern-triggered immunity? These and other questions provide exciting opportunities for more breakthroughs in the future. Birkenbihl RP, Kracher B, Somssich IE (2017). 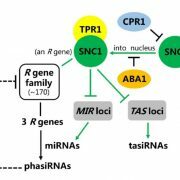 Induced Genome-Wide Binding of Three Arabidopsis WRKY Transcription Factors during Early MAMP-Triggered Immunity. 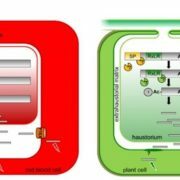 Plant Cell 29: 20-38. doi: 10.1105/tpc.16.00681. Fu ZQ, Dong X (2013). Systemic acquired resistance: turning local infection into global defense. Annu Rev Plant Biol 64: 839-863. doi: 10.1146/annurev-arplant-042811-105606. Mao G, Meng X, Liu Y, Zheng Z, Chen Z, Zhang S (2011). Phosphorylation of a WRKY transcription factor by two pathogen-responsive MAPKs drives phytoalexin biosynthesis in Arabidopsis. 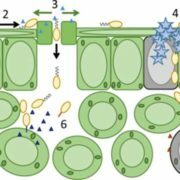 Plant Cell 23: 1639-1653. doi: 10.1105/tpc.111.084996. Ren D, Yang H, Zhang S (2002). Cell death mediated by MPK is associated with hydrogen peroxide production in Arabidopsis. J Biol Chem 277:559-565.